Once the rockets are up, who cares where they come down? That’s not my department. 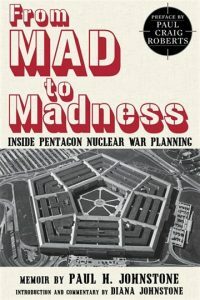 From MAD to Madness: Inside Pentagon Nuclear War Planning is the enlightening memoir by Paul Johnstone, a man who worked in the “department” that decided where “they” would come down. Johnstone labored there during WWII and then from 1949 to 1969, the initial period of the Cold War and the period covered by this book. On August 29, 1949, the USSR caught the world flat-footed when it set off its first nuclear bomb. Thus began the years when frightened children scrambled under their desks by day and were tormented with mushroom cloud nightmares by night. The U.S. and the USSR stood on The Brink over the Cuban Missile Crisis and the Berlin Crisis when The Wall went up. Those years were the initial period of nuclear standoff called MAD (Mutually Assured Destruction). What Johnstone saw as he went about his duties horrified him – and it should also horrify us. For it is the thesis of the Afterword, by the author’s daughter, the prominent political commentator Diana Johnstone, that after the demise of the Soviet Union, the U.S. moved quickly from “MAD to Madness.” Madness refers to plans for a knockout nuclear first strike on Russia, aided and abetted by the latest missile defense boondoggle. That was a favorite fantasy of the generals in the post-WWII era. Whether we now live in another era of Madness, when a disabling first strike again dances in the heads of the Elite, or once again in an era of MAD is an open question in my mind. But Paul Johnstone’s memoir is a work of great importance in either case. Paul Johnstone started out in Henry Wallace’s Dept. of Agriculture during the New Deal, but was moved to the Department of War after Pearl Harbor. His job was to pick targets for conventional bombs in Japan, although not the targets for the first atom bombs. When the Cold War commenced, he studied how targets for nuclear weapons should be selected and how much damage The Bomb would do when dropped on various corners of the USSR. He also assessed the damage of Russian nukes landing in various corners of the U.S. He worked at the most august levels of US intelligence: Air Force Intelligence, the Joint Chiefs of Staff and the Office of Secretary of Defense. Some of Johnstone’s studies became part of the Pentagon Papers, and Daniel Ellsberg. Johnstone gave the manuscript for this memoir to his daughter, Diana Johnstone, when he was on his deathbed in 1981. A central message of the book is the inevitable failure of intelligence. This aspect of the memoir is hard to apprehend in all its facets without actually reading it. Why can “intelligence” not be trusted? First the intelligence agencies lie – and do so quite consciously when it suits those who command them or the desires of those who command their commanders. Anyone who does not recognize this by now has not been paying attention. Intel did this most notoriously in recent years in the case of the non-existent WMD that led the US to a multitrillion dollar war on the innocent people of Iraq – which we fight to this day even though Barack Obama declared the war “officially” over. So the “decision makers” for nuclear war could well be acting on intel that is “a wild guess,” and they would not know it! “I believe that, to anyone who has been deeply immersed in it and then has had the privilege of viewing it with some measure of detachment, military intelligence must seem a world of flickering light, dark shadows, mood music and whispered rumors, half heard against trumpeted accompaniment proclaiming dire threats that imperil us from outer darkness. Shapes are partly perceived at best, most commonly merely implied, often not seen at all, and often what you think you see is really not there at all. There are always some things you know you know, but you never know how many things there are that you have no evidence even to suspect. You do not know how much of what you see is deliberately staged to mislead you. What is seldom realized is that there is always a dominant mood that determines, more than the sharpest senses or the most acute reasoning, what you decide is out there and what is going on. Like all the world and all experience, it is kaleidoscopic; and the bits and pieces that flit before your eyes are what you thought you’d see before you looked. In other words, in the end the data and analysis do little more than to confirm pre-existing sentiments and prejudices. The issues that Johnstone raises are relevant not only for scholars, but for each and every one of us since our very existence hangs by a thread increasingly frayed by the incessant anti-Russia drumbeat in our media. That drumbeat has reached a neo-McCarthyite crescendo in these days of Kremlin Gate where politicians crazed by hatred of Putin like John McCain or hatred of Trump like nearly every last Democrat hold sway. I remain unconvinced only by one conclusion of the book and that lies in Diana Johnstone’s Afterword. One thesis of the Afterword is that we went from the era of MAD back to the era of Madness, that is an attempt at a nuclear first strike, after the demise of the USSR. That may well have been true in the first decade of the Century when Russia was still on its back and China was relatively weak. (Diana Johnstone cites literature from this period to make her case. See also “The End of Mad”.) Bush was in power then, and the neocons were in the driver’s seat. Bush withdrew from the ABM treaty in June, 2002, which opened the door to developing the ever elusive anti-missile system that would make possible a first-strike on Russia and/or China. (At times first strike capability is called “nuclear primacy”.) Those ABM plans persisted and have been implemented right up to the present with their deployment in Eastern Europe nominally against Iran and in South Korea nominally against the DPRK. They are in fact aimed at Russia and China, and no one is fooled by other claims, least of all Russia and China. But we are now 15 years out from 2002 and Russia’s economy and military are much stronger under Putin. Moreover, China’s GDP was only about 18% of the US GDP in Purchasing Power Parity terms in 2002; it is now in 2017 about 120% that of the US., and the gap grows daily. And of course military power grows out of economic power. Things have changed. Certainly, the US maintains a vast edge in its military capability, but is it enough for the neocons and neoliberalcons to realistically dream any longer of a nuclear first strike? I doubt it, but the grave danger is that they are living in the past and that their “intel” is telling them that nuclear primacy is still theirs. Why? Because the intel agencies might feel that is what their bosses want to hear. After all, who wants to abandon past glory. Empires do not have a great track record when it comes to accepting decline. Living in the past is one of the things that might concern us after reading Paul Johnstone’s work. So it is a book of considerable importance for the moment. It warns us of the perilous age in which we live, and it tells us that the need to create a structure of peace in a multipolar world is urgent. This article was posted on Saturday, May 13th, 2017 at 5:09pm and is filed under Book Review, Nukes.